When my parents first met my fiance’s parents – I was super nervous. Probably because I thought that by the end of the meal, they would have decided that Andrew and I shouldn’t get married! Luckily, over loads of good food (and some Colombian charm ;)) they got along great. My soon-to-be father-in-law (in 3 days!!! woo!) made this delicious marinated pork loin, and I am pretty sure I ate about 3 pounds worth. It was AMAZING. The best part? It’s only two ingredients! And he shared his special grilling secret with me – just keep the temp low and cook slow! Enjoy! With only 2 ingredients, this dish could not be easier!!! The night before, place the whole pork loin in an airtight container (or a ziploc bag) and cover completely with 3/4 of the bottle of Italian dressing. Set aside the remaining dressing for cooking. 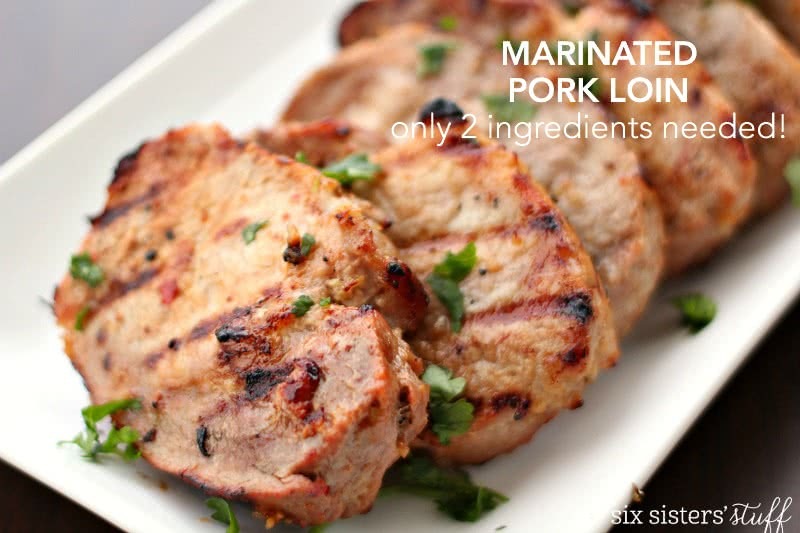 Place pork loin in the fridge and let marinate overnight (it makes it REALLY tender!). When you're ready to cook it, set your grill to the lowest heat setting (the trick is to cook it low and slow). Set the whole pork loin directly on the grill and cook each side for a couple of minutes (I did about 5 minutes a side). Then cut the loin into 1" slices. Baste each slice with the remaining Italian dressing. You should flip the slices every three minutes or so, basting with marinade each time you do. Grill until the internal temperature of each 1" slice of pork reaches between 145-160 degrees F (depending on how you like your pork) . Total grill time was about 30 minutes, but it will vary depending on the heat of your grill. Oh, yum! Looks fab! But, now let's get to the good stuff: Good luck on the wedding! WOOT, WOOT!!! Why would you slice the roast into chops on the grill? Why cut the meat then grill? What is the purpose of this? You can alter the recipe to your liking. This was handed down to us from Stephanie's in-laws and this is how they made it. It was very delicious!